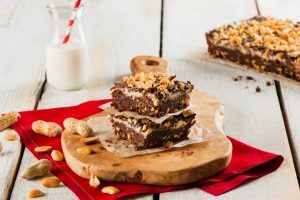 All Canadians know and love the Nanaimo bar, but did you know that peanut butter was invented in Canada too? We can’t think of a better way to show your true patriot love than with this peanutty twist on the classic dessert. More great recipes can be found at www.peanutbureau.ca. 1. Preheat oven to 350°F (180°C). To help parchment stick, lightly grease an 8×8-inch (2-L) baking pan, then line with parchment paper so the edges overhang pan. In a large bowl, combine melted butter, cocoa powder and sugar, stirring until smooth. Add egg, graham crumbs, peanuts and coconut, and stir to combine. Stir in chocolate chips until mixture is well blended. Pat mixture into the base of the prepared pan. Bake for 10 to 12 minutes, or until set and no longer shiny. Refrigerate until room temperature. 2. Meanwhile, using an electric mixer, beat peanut butter with butter, icing sugar, milk and vanilla until smooth. The filling will be quite thick. Once the base has cooled, spread peanut butter mixture evenly over top. Refrigerate until firm. 3. In a microwave or in top of a double boiler, melt chocolate with butter. Drizzle over the firm filling layer, spreading to cover. Sprinkle with peanuts. Refrigerate until set, about 30 minutes. Using parchment paper, lift the Nanaimo bars out of the pan. Slice into bars or squares.